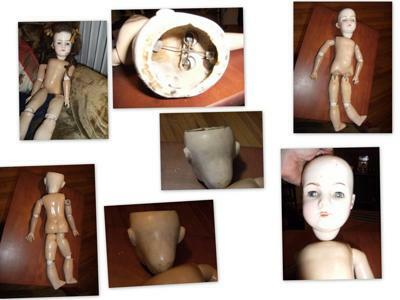 This doll was found in an old suitcase along with a child's silk stocking, an old child's apron and a christening gown w/bonnet among other antiques. This doll is 18" and, I believe, Composition. None of the doll is stuffed or leather. Her head looks more 'bisque', her appendages are wooden ball jointed. She has movable blue eyes with upper lashes. Brows, nostrils are painted on. Her mouth is open and she has 'teeth' which hang from the back; wooden possibly. Her face is lovely. She has an open head on top and her brunette wig is glued on. Her fingers are separated and her index fingers on both hands are raised, slightly, above the other fingers. She has toes and the lines between the toes and toe nails are painted on. On the back of her head it reads BES(T)--(D) below that it looks like a M then some spaces and 002 (?). She seems to be of original excellent quality however age is showing it's signs. She has a blue dress on however I have no idea if it is an original. I have searched the Bester Doll Manufacturing Company, German dolls, French dolls, American Dolls, Compo, wooden, bisque...for hours and hours and cannot come up with the answer for my question: Who is she? Comments for Who is she? Hi everyone, from beautiful New Zealand. Without being able to clearly see the markings/features on your bisque head this is just an educated guess. I believe though that your doll was made by the Bester Doll Co. of Bloomfield, around 1919 to 1921. They sold their dolls direct to the trade, so their heads could have also been made by any head maker, including Morimura Bros who distributed their dolls. Whereas Best & Co (New York 1902) distributed dolls, Bester actually made dolls according to my material. The markings on the neck also indicate Bester, since their markings were BESTERDOLL Co. then underneath that BLOOMFIELD. The d on your head could be part of that, and the m underneath could be part of Bloomfield. Her teeth will be porcelain, her eyes will be glass. Her head as you probably already know will crack/break so handling carefully is a good idea, whereas the body being composition is much hardier.. I'm sure others have helpful suggestions too.